Do you know how many calories are in this cheeseburger? A survey suggests most people don't. 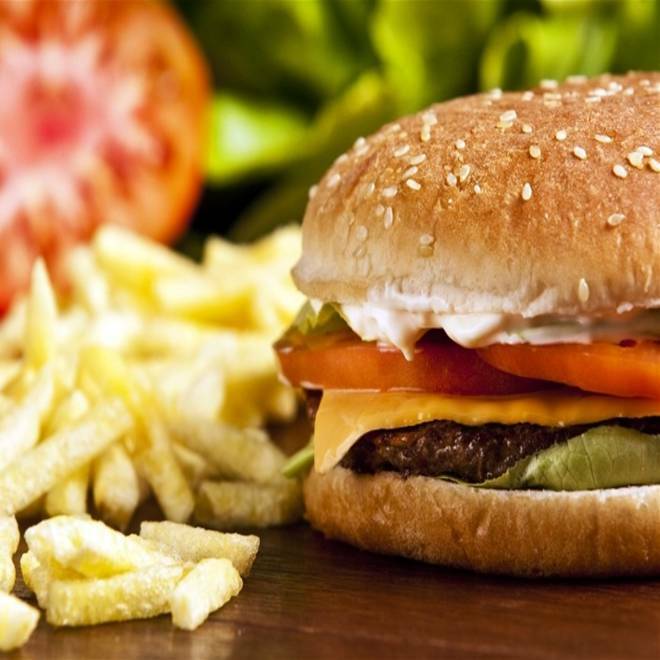 People may realize that fast food isn’t health food, but they don’t realize just how fattening it really is, researchers report. They surveyed people eating at 10 burger, chicken, sandwich and doughnut chains and found they greatly underestimated just how much they were chowing down. The worst was Subway, which promotes itself as a healthier alternative, the researchers at Harvard Medical School found. “At least two thirds of all participants underestimated the calorie content of their meals, with about a quarter underestimating the calorie content by at least 500 calories,” Harvard’s Jason Block and colleagues wrote in the British Medical Journal. They interviewed more than 3,000 adults, children and teens visiting six different fast-food chains in Boston; Providence, Springfield, Mass. and Hartford, Ct., asking them how much they ordered and how many calories they thought they were getting. The surveys were done in 2010 and 2011, before some regulations about calorie labeling came into effect. People ate a lot. Checks of the receipts showed adults ate on average 836 calories in a meal, while teens and children ate more than 700. But they estimated, on average that they were getting 175 calories less. “The mean underestimation of calorie content was larger among Subway diners than those at other chains for adults,” Block’s team wrote. The average U.S. adult needs about 2,000 calories a day, and kids need less. So people were getting more than a third of their day's calories in a single fast-food visit. And studies show that eating just 100 calories in excess a day can add up to several pounds of extra fat over a year. Many states and cities have passed tough calorie and fat-labeling laws. The 2010 health reform law will require major restaurant chains to provide clear calorie labels on menu boards. Consumer advocates have complained for years that Americans don’t get the information they need to make healthy food choices. Not only are fatty, sugary foods everywhere, but it’s often hard to find out how many calories and how much fat and sugar these foods pack. Chain restaurants often list their nutritional information on websites or on menus kept behind the counter. What advocates want – and what governments are starting to require – is information listed right next to the food items on the menu board, so people are forced to see it when they order. Block’s team looked at the biggets national chains: McDonald’s, Burger King, Wendy’s, KFC, Dunkin’ Donuts and Subway. “We excluded pizza restaurant chains (such as Pizza Hut) because of the difficulty in determining the quantity that an individual bought for personal consumption,” they wrote. About two-thirds of the adults taking part were overweight or obese – reflecting the actual U.S. population, the researchers found. About a third of the teens were, while 57 percent of the school-age children were. “Over 40 percent of participants in each sample ate at the chain restaurant where they were interviewed at least once a week,” the researchers wrote. Fewer than one in five had even noticed any calorie information, and only 5 percent said they used that information to help them choose meals. Subway advertises itself as a healthier option. “Branding could be an important component of Subway’s ‘health halo’,” the researchers said. They believe the new labeling requirements will do a lot to help people understand how much food they really are getting in a fast-food restaurant. “Previous research has found that information can be most powerful when it contradicts previous expectations (in this case, improper estimation of calorie content of foods with a ‘health halo’),” they wrote.